No one needs a 503-horsepower SUV capable of 155 miles per hour. 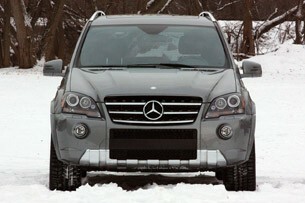 In the real world, the 2011 Mercedes-Benz ML63 AMG makes no sense whatsoever. But you want one all the same. We understand. All it took was one glance at its massive tailpipes out back for us to fall in love. 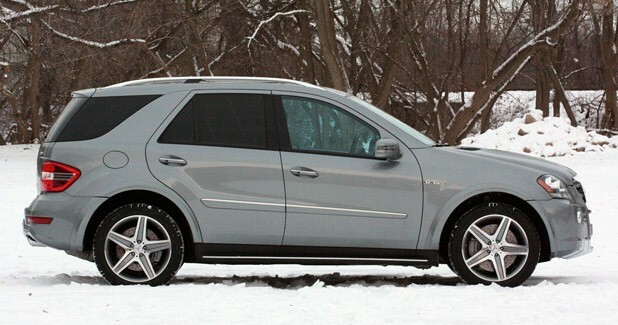 The ML63 is fitted with equal parts absurdity and brilliance, and almost immediately, our minds filled with images of blasting the AMG SUV along the snowy roads of southeastern Michigan, its 6.2-liter V8 bellowing at full volume, ricocheting off the concrete overpasses looming above metro Detroit's Interstate 696. 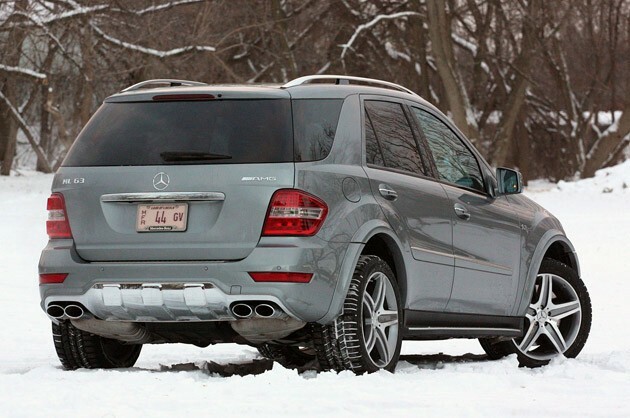 Senior editor Damon Lavrinc appropriately described this behavior as "suburban winter assault," but as we found during our week-long winter test, the ML63 AMG is perfectly equipped for battle no matter the weather. In all honesty, the ML is a rather ugly thing, particularly in front. Mercedes-Benz stylists haven't translated the brand's design language to their mid-size utility as smoothly as the larger GL or smaller GLK, and we'd still prefer to look at a BMW X5 – particularly the M variant, or the markedly improved new Porsche Cayenne. Adding the bulgy AMG bits gives the ML more presence on the road without being as overtly snarly as its BMW or Porsche competition, but it's more imposing than attractive. 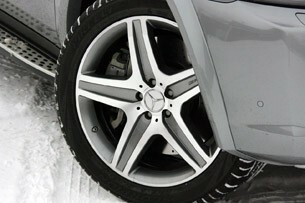 We're partial to the five-spoke, 20-inch AMG alloy wheels wrapped in Pirelli Ice & Snow 295/40-series rubber. 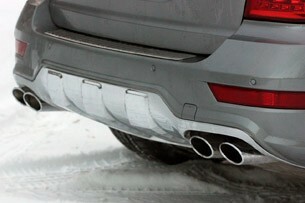 Even more than the large wheels and wider fender flares, the giant exhaust tips look fantastic, giving the ML63 a sense of performance presence from the back end, and the sound emanating from them is pure big-bore bliss. Overall, the M-Class design is simply growing a bit long in the tooth – a problem that will no doubt be fixed when the next-generation ML shows its face in the next year or so. We've seen plenty of spy shots of the new M out testing, and even when covered in camouflage, it's obvious that the subtle styling tweaks Mercedes has planned should do wonders for the exterior. The awkwardly shaped headlamps get a much-needed smoothing, and the taillamps grow in size, expanding onto the rear hatch. We anticipate good things, especially when the AMG team gets its hands on the refreshed 'ute. 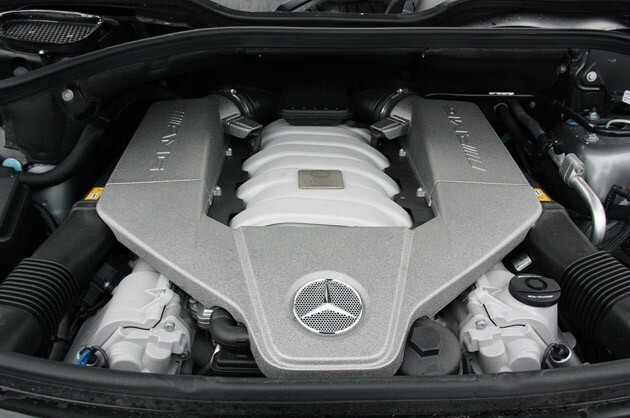 The biggest change for the new ML63 is an expected heart transplant – the naturally aspirated 6.2-liter mill should give way in favor of the automaker's new 5.5-liter twin-turbocharged V8. Sure, the new engine is more powerful while offering improved fuel economy, but we're really going to miss the current free-breathing setup, particularly the noise it generates while swinging to the far right side of the tach. 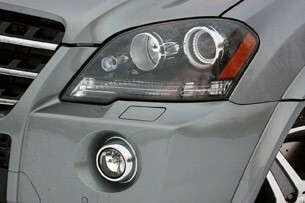 In the current ML63, the 6.2-liter V8 pumps out 503 horsepower and 465 pound-feet of torque – plenty of push. To compare, the BMW X5 M's 4.4-liter twin-turbo V8 is good for 555 hp and 500 lb-ft of twist, and the dearer Porsche Cayenne Turbo offers 500 hp and 516 lb-ft. This whole segment of overly powerful SUVs is awesomely absurd, and as much of a honey as the current AMG unit is, the new powerplant ought to make the ML63 more competitive with its insane contemporaries. The ML63 AMG doesn't do slow, and that's immediately noticeable off the line. Mercedes-Benz states that its 5,093-pound, all-wheel-drive utility vehicle will run to 60 miles per hour in just 4.8 seconds – one-tenth of a second quicker than a Porsche Cayman S. The AMG Speedshift seven-speed transmission is a perfect match for the naturally aspirated V8, firing off shifts with genuine quickness, with the paddle-shifters providing a level of haptic feedback better than most flappy paddles on the market. On many occasions, we found ourselves manually clicking down through the gears while decelerating to a stop, letting the revs peak close to the 7,250-rpm redline. The engine's sound is just that good, fuel economy be damned. Speaking of fuel economy, the ML63's numbers are, as you'd expect, absolutely horrific. 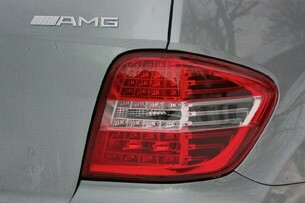 If you're on your best behavior, the AMG crossover will return 15 miles per gallon on the highway, 11 in the city. Us? We frequently saw single-digit mileage numbers. Adding up our data resulted in a 12.3-mpg as-tested figure. No matter. Nobody looking in this segment is remotely worried about efficiency and any concern for fuel economy is obliterated the moment you open the AMG brochure. 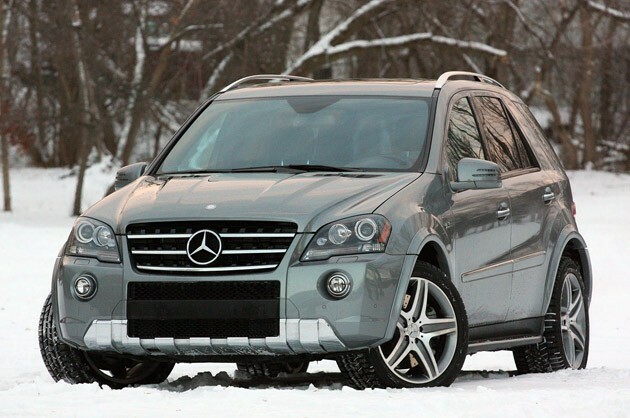 The combination of our tester's Pirelli winter shoes and 4Matic all-wheel drive resulted in a people mover that was perfectly suited for winter driving fun. The back end easily kicked out during turns at intersections, even under light throttle, but the traction control obediently pulled things back in line, and we never had an issue controlling the ML63 – even in thick patches of snow and ice. If you get this thing in the deep snow, be firm on the throttle and in nearly every circumstance, you'll have no problem powering through the slushy stuff. There's a strong tendency for all four wheels to spin upon takeoff in the snow and ice, but the ML63 never feels unwieldy in low-traction conditions. We never once felt like we had too much power, or that the throttle was too sensitive for winter commuting. 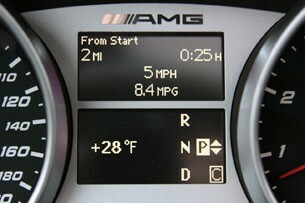 And while the AMG is best suited for driving quickly, it's extremely capable in the snow. We'd definitely prefer something with more ground clearance like a Jeep Grand Cherokee if we had to deal with larger accumulations of snow and ice, but for the occasional blizzard, the ML63 is both comfortable and capable while still willing to partake in a bit of hooliganism when provoked. On dry pavement, the AMG is simply a hoot. Its Airmatic-based AMG sport suspension uses adaptive damping to control ride comfort over a variety of road surfaces, and body roll is damn near nonexistent – a good thing, considering that the ML is a top-heavy SUV. However, we wish the steering were more dialed-in to suit the 'ute's performance proclivities, and while we're glad Mercedes has fitted the ML63 with a thicker, smaller-diameter steering wheel, we'd gladly welcome some more feedback at turn-in. 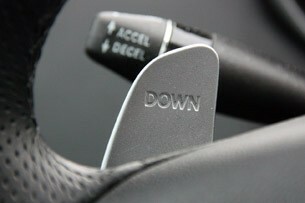 Overall levels of steering feedback aren't bad while turning, but it isn't nearly as precise as the X5 M's setup. From behind the wheel, we can't help but notice how the ML's interior – much like the exterior design – looks a bit out-of-date. The instrument panel still looks fresh, and we like the aluminum trim and AMG-specific gauges, but things like the center stack are dearly in need of an update. It's odd to say, but with Mercedes-Benz's COMAND system on hand, we prefer the large knob on the center console to control all of the functions rather than the hard buttons below the screen. 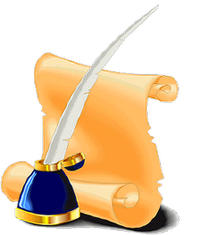 COMMAND is far from our favorite modern-day infotainment systems, though it's still less finicky than what you'll find elsewhere in the luxury set. The rest of the center stack is easy to operate, with two large dials controlling interior temperature with clearly labeled buttons in the middle to direct things like fan speed, heated/cooled seats and suspension settings. We're eager to see how Mercedes-Benz incorporates its newest interior refinements into the ML – something along the lines of what we find in the E-Class would surely do the trick. Overall comfort is still top-notch, and we have to tip our hat to the AMG sport seats fitted in the ML63. The perforated leather chairs are immensely comfortable, and with power adjustment for lumbar and side bolstering, it's easy to get a seat right where you want it. We took the ML63 for a couple of long drives through the winter sludge with no complaints to speak of. 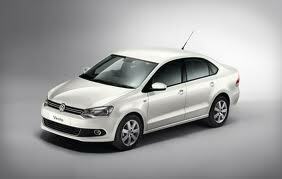 Visibility from all angles is good, and the cabin remains quiet even at higher speeds. Not too quiet, though – we had no problem hearing the growl of the V8 during instances of hard throttle. While there's no lack of awesomeness to the ML63 AMG package, we simply can't fathom the idea of shelling out our hard-earned cash for one. In the real world, go-fast SUVs like this, the BMW X5 M or Porsche Cayenne Turbo don't make any real sense. 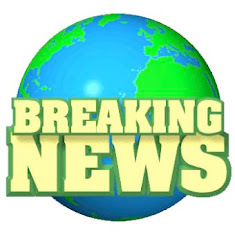 And while we wouldn't shake our heads at anyone who buys one, we know that our coin – $94,125 as tested – can be stretched a lot further. Spend $60,000 on a C63 AMG for the dry season and use the remaining $34K to get yourself a fully loaded Subaru WRX hatchback for winter (with change to spare!). But if you do insist on going for pure absurdity, just get Merc's own G55 AMG and call it a day. That'll rock your world, but the ML63 should still do nicely.